In2green’s first indoor/outdoor throw collection will debut this month at “High Design” as part of the Atlanta Gift Show, as well as at the Dallas Mart, Seattle Gift Show and NYNow. The line was conceived to evoke the feeling of being wrapped in nature, of becoming one with the environment that we live in. The throws with their ultra eco-innovative construction—using 78+ water bottles to make the 100% recycled polyester knit— both embrace an eco-conscious lifestyle while remain captivating from a design perspective. Inspiration for the line came from a trip to Miami Beach — known for its vibrant culture, chic hotels, and design district, Miami is a hub of outdoor inspiration. Wandering throughout South Beach led to photographing everything from furniture to textiles, from tented cabanas and beach umbrellas, to mosaics and vintage pool tiles. While we took notice of the unique colors, patterns, and the varied designer fabrics, we were struck by the lack of throw blankets, which we knew could bring a sense of luxury to these outdoor spaces. Building on the strong design elements we saw and keeping “wrapped in nature” in mind, we started developing bold graphics and a strong color palette. In our Flora collection, a foliage pattern in emerald greens and muted khakis captures tropical Miami and its sandy beaches. 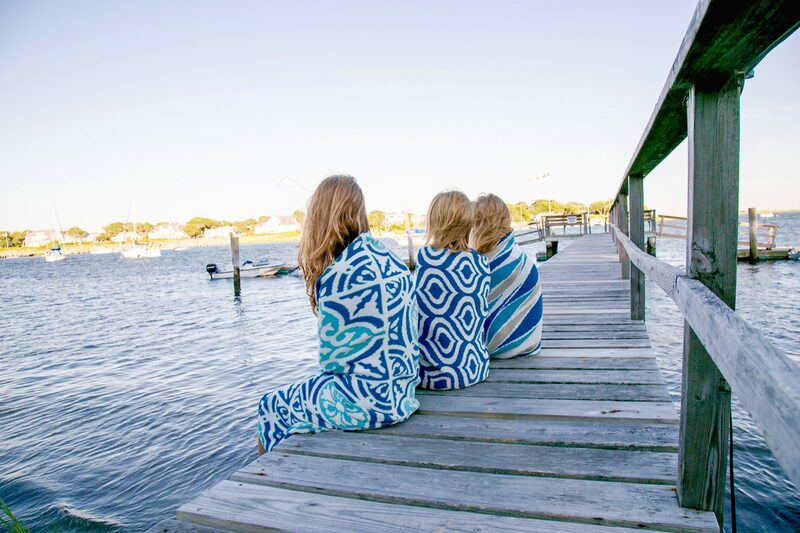 This collection then paved the way for oceanic blues and coastal motifs in our Breakers pattern, and a shifting underwater perspective for the Waterline. Modern interiors united with an old world European aesthetic in our Vintage Tile, and a timeless favorite, the Royal, was updated with a bold new look in the recycled polyester fabric. Each design was ultimately given a geometric and neutral partner to share its color story, making it the first luxury eco outdoor throw on the market.